On January 1, 2016, Illinois joined the ranks of states that have adopted the 2015 International Energy Conservation Code (IECC). See our Top 10 List of energy code changes for more details. Included with the new code adoption is the Energy Rating Index (ERI) compliance option, which has also been referred to as the HERS Option in the state energy code. HERS stands for Home Energy Rating System, and is a provision of RESNET, the Residential Energy Services Network. 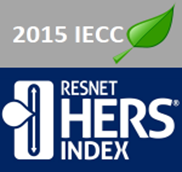 In 2014, there were 1,721 HERS-rated homes in Illinois according to RESNET. The average HERS Index Score of homes rated in Illinois was 59. RESNET and the International Code Council (ICC) recently conducted a webinar on the 2015 IECC ERI option, and the opportunities for RESNET HERS Raters to be ICC certified Energy Code Inspectors. To download the webinar go to: https://vimeo.com/140228425. RESNET and the ICC have also produced a video explaining how the HERS can be used to demonstrate compliance to an energy code. To view the video go to: HERS Index and Energy Codes. In summary, the State of Illinois now allows HERS Raters, such as we at Eco Achievers, to help show a building project's compliance under this new pathway of the Illinois energy code. The new state energy code went into effect throughout Illinois on January 1, 2016. More information can be found at our Top 10 list of changes, and details about the ERI can be found at: Illinois 2015 IECC and Energy Rating Index Option. Article adapted with permission from RESNET.